‘What’s next?’ seems to be the question for South Carolina this year. But like life, the answer is complicated. In the dance of the 2014-2015 college basketball season, the Gamecocks were the debutantes. Ranked second going in, they reeled off win after win and were soon number one, where they remained for most of the season. They finally lost a contest, to eventual champions Connecticut, on Feb. 9. They won the Southeast Conference title, the conference tournament, and went to the Final Four. Elite program status? Check. And that includes all the publicity and expectations that go with being newfound celebrities. South Carolina has been tabbed to win the SEC again this year, and are ranked second nationally. Some prognosticators have also picked them for a Final Four return. Fans? Check: the Gamecocks have set a school record for most season tickets sold, with more than 11,000 so far this year, and counting. So what is the next move for an emerging power? 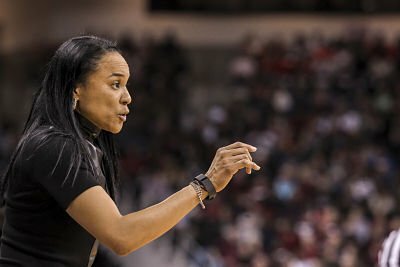 Coach Dawn Staley aims high, takes small steps and remains balanced. Coach Dawn Staley lead the South Carolina Gamecocks to their first Final Four last season. Photo courtesy of South Carolina Athletics. Ask Staley, who enters her eighth year as South Carolina’s coach this fall, what the team goal is this season and her answer is the same as many a coaching great before her. “We want to win a national championship,” she said. But in the next breath, Staley acknowledges that the team isn’t there yet. No doubt they will learn from this past weekend, when they battled UCLA to a three-point win in the game’s final minutes. They will learn as they travel to Hawaii this week and face a tough Arizona State team, as by Staley’s design, they will experience different styles of team play. The Gamecocks will learn when they face #15 Duke in two weeks, which will help them prepare for SEC play, where #4 Tennessee awaits. If they do emerge as conference champions once again, Connecticut will be there, as the national title has been theirs five of the last seven years. But Staley coaches as she played for so many years: without limitations. The road to a fantastic finish lies in the rebuilding that South Carolina is doing right now. It is easy to assume that because super-forward Aleighsa Welch and fellow starter Elem Ibiam were the only losses last season, that this year’s team is basically the same. Staley said that is not the case. All-American senior guard Tiffany Mitchell, sophomore forward A’ja Wilson and junior center Alaina Coates remain the top three scorers, as they were last year. Senior guard Tina Roy has stepped up in her new starting role, as has reserve forward Sarah Imovbioh – one of three newcomers. But Staley said the team still has much growth ahead of them. Mitchell agreed that the pieces have to come together. Staley has been drilling it in. 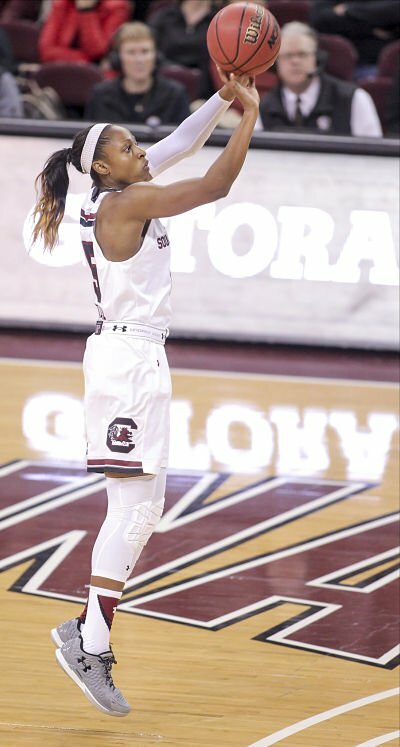 All-American senior guard Tiffany Mitchell is averaging 15 points per game over South Carolina’s first four contests this year. Photo courtesy of South Carolina Athletics. Though new to the elite program club, South Carolina has been building for quite some time. 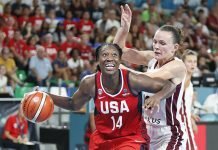 Staley, who had a storied career as a point guard at the college, pro and Olympic levels, understands the importance of process. After building a successful program as the head coach at Temple for eight years, she took the helm at South Carolina in 2008 when the Gamecocks were at a low point. In her first year, they went 2-12 in conference. The next year they were 7-9. Soon Staley began counting more victories, but they were of the grassroots, recruiting variety. Players began coming, and they keep coming. Half of the athletes on this year’s roster are from either South Carolina or North Carolina. Another four are from nearby Georgia, Louisiana and Texas. Mitchell, who was the Gamecocks’ top scorer last year, said she took a leap of faith when signing to the program. 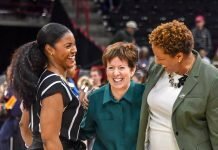 Staley gives a lot of credit for the Gamecocks’ growth to associate head coach Lisa Boyer, who coached with her at Temple and coached her professionally. The same can be said of first-year assistant Fred Chmiel. Assistant coach Nikki McCray-Penson played with Staley on the storied 1996 Olympic gold medal-winning basketball team under Stanford coach Tara VanDerveer. But though they’d prepared, last season’s ascent into basketball stardom was somewhat of a surprise. Fortunately for South Carolina, Staley brought the same poise in as a coach that she used to wield on the floor when it was she who was facing down opponents. Both Mitchell and Wilson said Staley did an exemplary job of keeping them focused during their first Final Four. 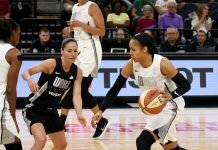 “She did a good job of…..getting us to take it as a regular game,” Mitchell said. Michigan coach Kim Barnes Arico uses the same terms to describe her friend Staley. “She has a great perspective in that she doesn’t get too high or too low; just has a great feel,” Barnes Arico said. No doubt a large chunk of that approach came from Staley’s days growing up in Philadelphia and playing street ball with boys until well past dark. It continued at the University of Virginia, where she was a three-time All-American, and on to the Olympic team and into the pros. Staley said she was influenced by both Cavaliers coach Debbie Ryan and VanDerveer. Playing for Staley is an intense experience, both on and off the court. Wilson acknowledged the demands, but said players understand what’s behind it. Mitchell said Staley’s focus is for the greater good. 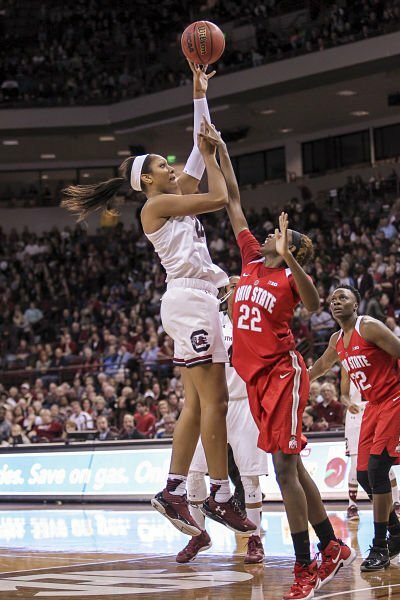 Staley’s methodical, step-by-step approach has paid dividends for South Carolina. She said young athletes are different now than when she was growing up. Staley said every day counts. Forward A’ja Wilson was the Gamecocks’ second-leading scorer last year, as a freshman. Photo courtesy of South Carolina Athletics. The good news for Staley and South Carolina fans is that Gamecock players are not only taking their newfound stardom in stride, but they’re using the pressure that comes with it as fuel. As a senior, Mitchell sees the ‘before’ and ‘after’ differences clearly. Going back to their home floor after the Hawaii tournament will be a welcome embrace for the team, as crowds at Colonial Life Arena are known for being loud and raucous. Mitchell said she truly appreciates the atmosphere. South Carolina begins SEC play Jan. 3, as they host Arkansas. Sparks need a change, but what kind?